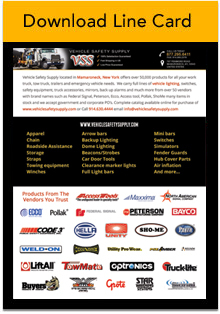 With literally thousands of accessories in our inventory, Vehicle Safety Supply has the best, most in-demand products from today’s leading manufacturers of lighting devices, back-up alarms, LED strobes, solenoid switches, wheel simulators, road service tools, sirens, and related items for trailers, work trucks, and emergency vehicles. Below you can view our current line-up of suppliers, which includes big names such as Peterson, Buyers Products, Truck Lite, Grote, Star Warning System, North American Signal, and many others. 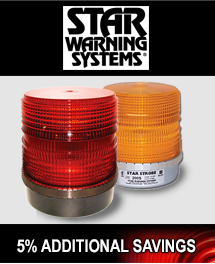 Whether you’re searching for Pollak ignition switches or Federal Signal strobe beacons, you will find it in our extensive catalog. Simply click on the links provided for further information.